Introducing Joy-Con, Controllers that make new kinds of gaming possible, for use with the Nintendo Switch system. The versatile Joy-Con offer multiple surprising new ways for players to have fun. Two Joy-Con can be used independently in each hand, or together as One game Controller when attached to the Joy-Con grip. They can also attach to the main Console for use in handheld mode, or be shared with friends to enjoy two-player action in supported games. Each Joy-Con has a full set of buttons and can act as a standalone Controller, and each Includes an accelerometer and gyro-sensor, making independent left and right motion control possible. 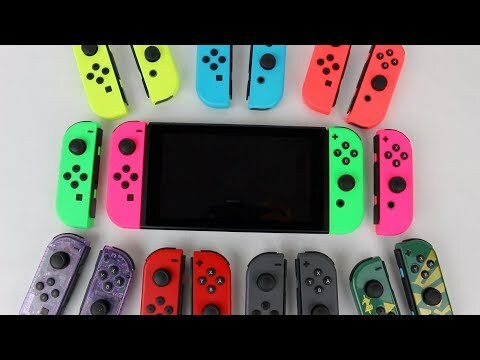 Includes 1 left Joy-Con, 1 right Joy-Con, and 2 Black Joy-Con wrist strap accessories.Two Joy-Con can be used independently in each hand, or together as One game Controller when attached to the Joy-Con grip.